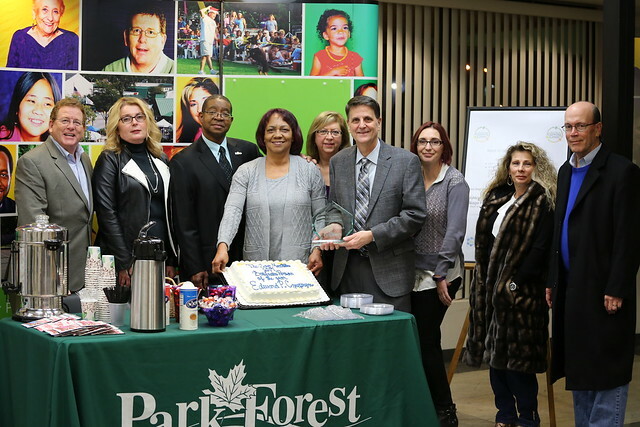 Czupryn was presented the Sam Montella Business Person of the Year Award Monday at Village Hall during Park Forest’s Board of Trustees meeting. The annual award, sponsored by Park Forest’s Economic Development Advisory Group (EDAG), considers nominations from the community in determining each year’s winner. The Park Forest Currency Exchange opened its doors in October of 1949 inside the Park Forest Plaza, making it the longest continuous business in the Village, having celebrated their 68th anniversary this month. Their current location on Orchard is the third spot it has occupied with the first two having been located inside the original Plaza. They have been at that location for 33 years moving there in 1984. Oddly enough it was not the first business opened by Ed’s family. In the founding days of the Park Forest Plaza, Ed’s maternal grandfather, opened both the Park Forest Plaza Barber Shop and the Park Forest Plaza Beauty Shop. Shortly after that Ed’s father opened the Park Forest Currency Exchange. All three businesses were fixtures in the Plaza for decades. Through their active involvement with the Community Currency Exchange Association of Illinois, which Ed is currently on the board of directors as their treasurer, the Czupryn’s are involved each year with the Back2School Illinois program which literally builds thousands of Back to School Kits containing pencils, pens, paper, notebooks and other school supplies that are then given out to students who can’t afford to purchase the items. Those Kits are then distributed by the various sponsors to local schools and also military families throughout Illinois. The Association is one of four Major Sponsors of the program. The Association, through Back2School, also gives out four (4) $2,500 college scholarships each year. For the last five years, the Park Forest Currency Exchange on its own has purchased 400 of the Kits from Back2School and personally distributed them to Park Forest Area School Districts. This last August, Ed and Monica along with their daughter Jessica presented 100 Kits to Park Forest School District #163. One nominator describes how for 15 years, Sherri, an employee at the Park Forest Currency Exchange, treated her mom with dignity and grace when she came in to cash her disability check. And, after her mom’s passing now treats her with the same professional patience “to the elderly and those with challenged disabilities, a friendly smile and warm words to all.” Another nominator mentioned that Ed supported little league baseball teams. The Currency Exchange provides a much needed service to the Village’s residents allowing them to pay their phone, gas, electric and other utility bills. Residents are able to apply for and renew license plates, update vehicle titles, cash payroll and personal checks, wire transfer funds, have items notarized and obtain money orders to name just a few of their provided services. It further provides a safe place for the distribution and cashing of monthly state assistance checks for Park Forest residents, as checks are delivered directly to the Currency Exchange. Each month the Park Forest Currency Exchange serves over a 1,000 Park Forest residents, who walk through their doors at 98 S. Orchard.